Platelet rich plasma (PRP) is a revolutionary regenerative medicine procedure that utilizes a substance derived from a patient’s own blood. Initially used to help speed healing after traumatic injury or surgery, in recent years PRP’s rejuvenative properties have been tapped to reverse the aging effects on skin, along with, stimulating natural hair regrowth. The platelets in blood contain growth factors that promote natural healing. The first step in any PRP treatment is drawing a blood sample. This is conducted in the office, just as it is for lab testing. The blood sample is then spun in a special machine called a centrifuge to produce a substance that contains 3X the amount of healing platelets than is naturally found in blood. Next, the PRP is injected into to the area in need of treatment. Can PRP Really Reduce Wrinkles and Rejuvenate My Skin? Because the patient’s own plasma is used, there is no danger of disease transmission, infection, rejection, anaphylaxis or neoplasia. Moreover, PRP has been used extensively and effectively for two decades in the fields of oral surgery, neurosurgery, plastic and cosmetic surgery, sports medicine and orthopedics. 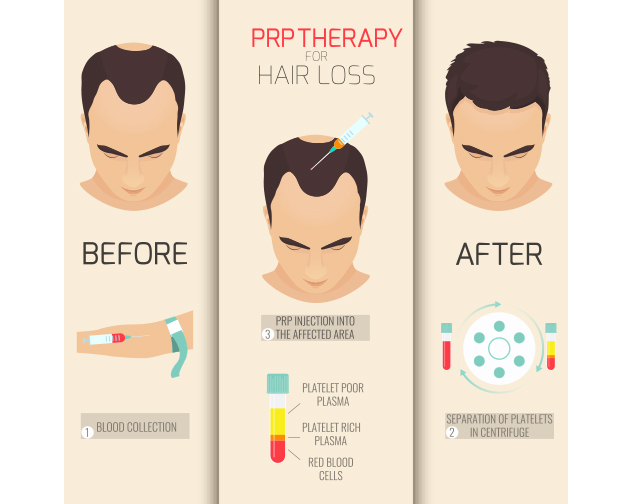 Can PRP Help Regrow Thinning Hair? Hair restoration is the latest frontier for PRP, and while extensive clinical trials have not yet been completed, the procedure shows great promise as a therapeutic option for patients seeking a non-surgical solution to hair loss. It shouldn’t be viewed as a “cure” for hair loss and no guarantee can be made at this time, since there is not yet FDA approval of PRP as a hair loss treatment. Nonetheless, PRP can theoretically promote hair growth by stimulating stem cells of the hair follicle. Currently, some hair transplant physicians use PRP to jump-start the growth of newly implanted hair follicles. Absolutely. In fact, it is encouraged. Dr. Rashid recommends PRP therapy be used in conjunction with Minoxidil and DHT blockers, or as an alternative to these for patients who cannot tolerate, or have side effects, with these medications. Like any procedure, individual results will vary. Who is a Good Candidate for PRP Treatments?Most patients are wonderful candidates for PRP. However, it is not advised for those with a history of heavy smoking, drug or alcohol use. Some medical conditions, such as platelet dysfunction syndromes, thrombocytopenia, hypofibrinogenaemia, sepsis, and acute and chronic infections, may also preclude an individual from undergoing PRP treatment.